Amy Brown, a teacher with 28 years of experience teaching biology and chemistry, and author of the blog Science Stuff, has compiled a CD packed with teaching materials on the skills that are essential for science. This Science Skills CD contains 51 files on a variety of skills used in every science class. They are directed primarily at grades 7 through 10, but can easily be adapted for other grade levels. Teaching materials will include: PowerPoint presentations, notes for teacher, notes for student, labs, worksheets, quizzes, homework assignments, practice worksheets, Jeopardy review games, crossword puzzles, unit tests, and answer keys. This CD can prepare your students for any science class! If they have these skills down, it makes studying the actual material easier. 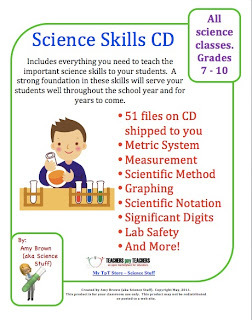 You can order the Science Skills CD for yourself right now OR… you can win one!!!! Amy is graciously giving one Science Skills CD to a Homeschool Scientist reader. Just leave a comment and be entered to win! I’ll choose a winner Friday, March 23rd at 5pm CST. After you enter, head over to Amy’s blog, Science Stuff, and check out all her great science resources! My little girl loves every subject in her home school program. She has a special affinity for science and this is something I want to be able to encourage as much as possible. Wow! Thanks for the chance to win a science cd! Would love to win this spaztastically wonderific resource for our honeschooling expiernce to intesify! Thank u Amy for giving one awat! What am amazing treasure trove!!! Thank you for sharing! My kids would love this. My son and I would love a smart new way to study science! Thanks for the chance to win! Science is a hard subject for me to teach. I would love to have more resources at my fingertips. Thanks so much! This looks like something my kids would really enjoy! We LOVE science, and this would be a great addition to our school! Great, I would love it! Thanks. This looks really great! Thanks for a chance to win! Would love to win!….Looks great! Sounds like a fabulous giveaway! Thanks for the opportunity, I hope to win. My girls love, love, love science. We would love to have this in our home! We are changing our science curriculum for next year and would love more helps in this area. Thanks for the chance. We spend almost as much time on science here as we do on literature…it would be a great help to add some new techniques to mix it up a bit in the home lab! Thanks! 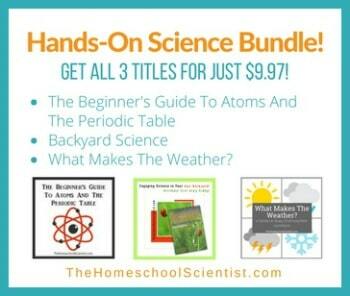 We love science at our house too, and I would love to have this as a resource for our homeschool! Would like to win this. Thank you for the opportunity to do so. Have a great day! Our 4 science-loving kids would love this! Fingers crossed! Looks like an awesome science cd! Thanks for the chance to win! As a Science Educator and devout believer in Science being taught as a practical subject, any resource that helps develops children’s skills would be incredible. Im a teacher in the UK and have just developed an inquiry based curriculum for children ages 5-9 and would love some extra material to support my work. Any help would be most welcome, even if you choose another person for the CD. Sharing resources is such a valuable enterprise. Looks like an excellent resource. Thanks for the opportunity. Thank you for your effort to compile such a comprehensive body of work. I teach middle school 6-8, plus have an 8th grader at home preparing for high school. This seems like it would be a wonderful supplement to my curriculum. What a great opportunity! Thanks for hosting this giveaway. This would be so fun for my children! Thank you for offering! Sounds great! What a great resource. I would love to have a copy! Is this drawing only for homeschoolers? I am a special ed science teacher who is always looking for good resources! Thank you for the opportunity to learn more about this resource for our science class! We would love to win a copy and share our experience with our friends. You are here: Home / Resources / Science Skills CD Giveaway!